Cross posted from The Real Ewbank. Of all the news and commentary I read about Earth Hour in Australia, not once did I see a mention of the billions of people that now live in energy poverty. Event organizers and commentators failed to discuss the fact that while millions of people around the world symbolically switched off their lights for one hour, billions are desperate to turn their lights on. For an event that professes to support climate change solutions, one would think that addressing energy poverty without wrecking our climate would feature prominently in Earth Hour campaigning. So why was energy poverty ignored? And what does this say about the environmental thinking that informed Earth Hour? The Earth Hour event spearheaded by the WWF rightly draws attention to the adverse impact of our carbon-intensive energy economies. However, it presents a misleading picture of the cause of climate change and its solutions. Energy consumption it not the problem, it’s the use of specific energy sources like coal, gas and oil that must be stopped. This objective will not be achieved by switching off the lights. It will be achieved by a comprehensive renewable energy policy that seeks to make clean energy cheap, as soon as possible. By asking the community to switch off the lights and other energy consuming devices for one hour, the campaign wrongly communicates electricity consumption as the main cause of climate change. While supporters of Earth Hour might argue that climate solutions involve more than turning off the lights, the big switch off remains the central message communicated by the event. WWF’s decision to frame climate change as a problem of pollution from energy consumption excludes the other drivers of climate change, including deforestation, agricultural practices, the design of our cities, and structure of our economies, to name a few. The narrow problem definition obscures the multiple causes of climate change, barriers to action, and the creative solutions to address them. The WWF’s Earth Hour campaign reflects what the Breakthrough Institute’s Ted Nordhaus and Michael Shellenberger call the ‘pollution paradigm’—a mindset where human actions are understood as harmful intrusions that pollute environments that are constructed as pure, natural, distinct and separate from humans. Within this model the aim of environmental action, or in this case Earth Hour, logically seeks to limit and control such intrusions. This paradigm and its tacit assumption that humans are not environment helps explain why the Earth Hour campaign fails to account for the billions who live without energy. This thinking is still prevalent in environmental thought and action, and has no doubt motivated the anti-Earth Hour backlash. Created by the US based libertarian think tank the Competitive Enterprise Institute, and promoted in Australia by the Conservative Leadership Foundation, Human Achievement Hour seeks to reframe energy use as a symbol of human greatness, not sin. It is a conservative rejection of a moralizing climate change discourse that promotes self sacrifice and the notion that humans ought to be ashamed of enjoying the benefits of a modern economy. Some environmentalists will dismiss the conservative critique that Earth Hour ignores human achievement as more right wing madness, reminiscent of the US Tea Party movement. Yet, the conservative claim is valid, and environmentalists ignore it at their peril. Of course it’s worthwhile to consider human achievement, but contrary to the Competitive Enterprise Institute’s belief, our civilization’s use of energy is only a partial success. How can we celebrate Human Achievement Hour when so many live without access to electricity? By this measure the Competitive Enterprise Institute is as guilty as WWF for failing to mention the poor (although they do so for different reasons). And the ideological battle between old environmentalism and modern conservatism does nothing more than obscure the challenge of poverty further. So is their hope for Earth Hour? Can it adapt to account for energy poverty? I think it can. With some simple changes to its messaging, WWF can reframe the event and break out of the narrow environmental thinking that constrains it. By embracing a platform of sustainable development WWF can present the symbolic act as a way of experiencing the energy poverty that billions endure every day. The campaign would then elevate the need to make clean energy cheap to overcome the dual challenges of poverty and climate change. Regardless of how you spent last Saturday night, whether it involved Earth Hour, Human Achievement Hour, both, or neither, we must ensure that energy poverty receives the attention it deserves in the future. Until renewable energy is cheaper than coal and other fossil fuels, developing nations are destined to build carbon-intensive energy infrastructures, making it more difficult for the world to limit climate changes. We must build a campaign around powering the world with renewable energy so we can celebrate our earth and human achievement every day. Regardless of whether you agree with the conservative critique of Earth Hour, the arguments put forward by Human Achievement Hour have the potential to appeal to large swathes of the public. It takes no stretch of the imagination to see that people might be attracted to an event that is free from guilt. Does the environment movement really want to be associated with turning the power off, especially now that there is an opponent that has claimed to represent human progress and modern living? The emergence of this group demonstrates that a campaign built on the foundation of a pollution paradigm is limited in its ability to reach new audiences and attract support from across the political spectrum. From its start on the family farm with a single farm-scale ethanol facility to dozens of multi-million gallon per year biorefineries dotting the Midwest countryside, POET LLC of Sioux Falls, South Dakota, is now the world's largest biofuels producer. Today at theEnergyCollective.com I've posted an exclusive podcast interview with Nathan Schock, director of public relations for Poet. We discuss biofuels, the company's plans for a next-generation cellulosic ethanol biorefinery, and the future of the ethanol industry. Head over to theEnergyCollective.com to listen to the full podcast interview and find out more about Poet's cellulosic ethanol plans, hear Schock defend the current excise tax credit for corn ethanol (which theEnergyCollective.com contributor Robert Rapier has argued is now a big waste of taxpayer dollars), and a discussion of the most important policy steps Washington can take to help innovative firms like Poet make commercial cellulosic ethanol production a reality. Pop Quiz: Which Has a Greater Power Output, A Boeing 747 or an Aircraft Carrier? That's actually a trick question: both a Boeing 747 and a Nimitz-class aircraft carrier have peak power output of around 190 MW! (That's the peak rating for an aircraft carrier, and a 747 has an average rating of 140 MW, both according to Wikipedia, so I'm assuming the 747's peak rating is about the same as the carrier). The 'miracle' of human flight at near super-sonic speeds is certainly an energy-intensive endeavor. Here's another perspective: a typical U.S. house uses about 1.3 KW of power on average. So a 747 jet flying with 140 MW of average power output (140,000 KW) is consuming as much power as over 100,000 U.S. homes! Or put another way, a 747 flying five hours from San Francisco to Washington D.C. consumes 700,000 KWhs of energy, enough to fuel the electricity use of an average American home for more than 61 years! This should actually come as no surprise when you consider that a jet can vault a couple hundred people through the air in a steel tube across an entire continent in five hours... But these figures are astonishing in some ways nonetheless. In the aftermath of the Great Recession, the United States faces serious questions about the future of its economy and jobs market. Where will the good jobs of the future come from, how do we prepare the American workforce, and what is our strategy to maintain economic leadership in an increasingly competitive world? A growing consensus suggests that clean tech will be one of our generation's largest growth sectors. The global clean-tech market is expected to surpass $1 trillion in value within the next few years, and a perfect storm of factors - from the inevitability of a carbon-constrained world, to skyrocketing global energy demand, to long-term oil price hikes - will drive global demand for clean-energy technologies. That is why the national debate about global clean-tech competitiveness is so important, sparked by the rapid entry of China and other nations. My colleagues and I recently contributed to the discussion with "Rising Tigers, Sleeping Giant," a large report providing the first comprehensive analysis of competitive positions among the U.S. and key Asian challengers. In order to compete, we found, "U.S. energy policy must include large, direct and coordinated investments in clean-technology R&D, manufacturing, deployment, and infrastructure." But even if the United States adopts a real industrial policy for clean energy, there is little evidence that our workforce is skilled enough to compete. Unfortunately, according to the Department of Energy, "The U.S. ranks behind other major nations in making the transitions required to educate students for emerging energy trades, research efforts and other professions to support the future energy technology mix." A competitive energy workforce requires much more than technicians and building retrofitters. Scientists, engineers, high-tech entrepreneurs, and advanced manufacturers will play a critical role, just as they have in strategic sectors like infotech, aerospace, and biotech. The federal government has started to address the need for green technician and efficiency retrofit training, such as with the Green Jobs Act, but it has not implemented an education strategy to keep the U.S. at the leading edge of energy science, technology, and entrepreneurship. Unfortunately, the majority of our colleges and universities lack degree programs focused on energy, and the U.S. power engineering education system is on the decline. Over the next five years, 45 percent of electric utility engineers will be eligible for retirement, along with 40 percent of key power engineering faculty at U.S. universities, according to a report by IEEE. "Engineering workforce shortages are already occurring," the report concludes. "We need more electrical engineers to solve industry challenges, and to build the 21st century electric power grid... Meeting these needs requires long-term investment now." Meanwhile, other countries are producing a substantially larger portion of scientists, engineers, and researchers that will benefit their clean-tech industries. Science and engineering make up only about one-third of U.S. bachelor's degrees, compared to 63 percent in Japan, 53 percent in China and 51 percent in Singapore, and the number of Chinese researchers is now on par with the United States (though some have pointed out that the quality of these graduates and researchers is not always comparable). 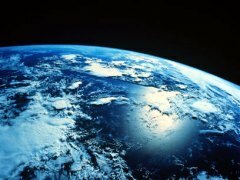 "Over time," stated a recent report by the National Science Board, "the United States has fallen from one of the top countries in terms of its ratio of natural science and engineering degrees to the college-age population to near the bottom of the 23 countries for which data are available." The energy workforce deficit and STEM education gap will substantially limit the nation's ability to lead the clean-tech industry and accelerate clean energy development. As Nobel Laureate Paul Krugman put it, "If you had to explain America's economic success with one word, that word would be 'education.'" In order to succeed in the clean-tech industry, the U.S. must develop an energy education strategy to develop tens of thousands of advanced energy scientists, engineers, and entrepreneurs, as well as technicians. Recognizing these trends, several experts have called for federal programs to develop our advanced energy workforce. In April 2009, President Obama took up these recommendations by announcing the first nationwide initiative to inspire and train young Americans "to tackle the single most important challenge of their generation -- the need to develop cheap, abundant, clean energy and accelerate the transition to a low-carbon economy." The proposal, called RE-ENERGYSE (Regaining our Energy Science and Engineering Edge), is part of the administration's 2011 budget request, which will be considered by Congress in the months ahead. With oversight from the Department of Energy and National Science Foundation, it would educate thousands of clean-energy scientists and engineers, beginning with $74 million for energy-related programs at universities, community and technical colleges and K-12 schools, with the largest component focusing on higher education. RE-ENERGYSE is an important step toward creating a competitive U.S. clean-energy workforce - that is why thousands of students and dozens of professional associations want it to succeed, and that is why Congress should fund it at the full budget request. Beyond RE-ENERGYSE, the federal government should work to expand these programs into a clean-energy education strategy on par with the National Defense Education Act of 1958, which helped reposition the U.S. in the space race and achieve revolutions in information technology. The global clean-energy race represents one of the greatest challenges for American leadership in a generation, and now is a critical moment. If we do not immediately implement a national strategy for energy leadership - including smart investments to educate the energy generation - we will miss a historic economic opportunity. American students are willing to rise to this national challenge, and we need the support of our government to succeed. Teryn Norris is Director of Americans for Energy Leadership, Senior Advisor at the Breakthrough Institute, and a Public Policy student at Stanford University. The CBS Evening News has profiled the U.S. position in the global clean energy race for a segment called, "Where America Stands," and unsurprisingly, America stands behind China and other nations in developing and producing the technologies that will underpin the tremendous growth of the global clean energy sector over the coming decades. CBS correspondent Celia Hatton reports, "China is the country cashing in on the green revolution." The video echoes the findings of a recent report on clean tech competitiveness by Breakthrough Institute and the Information Technology and Innovation Foundation, "Rising Tigers, Sleeping Giant," which notes that other countries have surpassed the United States in the production of virtually all clean energy technologies, from solar and wind, to nuclear and high-speed rail. Hatton reports that China also dominates manufacturing in other "eco-products" like electric bikes, solar hot water heaters, and electric vehicles. What should the United States do to stay in the game? Some have argued that all the United States needs to do to stay competitive is to put a price on carbon, and wait for the market to do its magic. But CBS takes a closer look at what's needed to compete: "In the long-term, experts say U.S. government policies should build on America's strengths: technological innovation and highly efficient manufacturing to compete with China's unbeatable wages." Investing in clean technology research and development is particularly critical since other countries, including China, are moving quickly to close the innovation gap with the United States. Without such investments, the new clean energy technologies may not just be manufactured in China, but invented there, too. The federal government should be investing "tens of billions of dollars" annually to drive a Manhattan Project-style pace of innovation necessary to address the scale of the energy challenge facing the U.S., said Energy Secretary Steven Chu yesterday. "If you look at the amount of funding for that [the Manhattan Project], and the amount of funding to put a man on the moon, it was a huge spike in funding. I think we do need that. The recovery act actually was the start of that...you still need I think tens of billions of dollars as a minimum per year invested in these technologies and the associated science. The DOE, our base budget for energy research is on a scale of $3 billion...the primary energy industry budget is about $1 trillion, if it's a high tech industry 10-20% is the usable amount of sale that you invest so that's $200 billion, so what we're investing in federal dollar is less than 1% of that or on a scale of 1% of what should be invested." The Secretary highlighted the steps the Department of Energy was taking to encourage innovation given the limited funds available, including including the launch of the new Advanced Research Projects Agency for Energy and several Energy Innovation Hubs (nicknamed Bell-lablets) based on the storied Bell Labs innovation model. Unfortunately, when the time came to make recommendation about what the assembled audience could do to help confront the massive climate challenges facing the country, Secretary Chu's suggestions were a swing and a big miss. All he had to offer were two suggestions: "become better informed and then teach others" and put your computer on sleep mode. Not exactly inspiring words for a room full of eager Stanford students, the nations "best and brightest." The Secretary wasted a prime opportunity to inspire and rally a room-full of the next generation of young political leaders, entrepreneurs and innovators to tackle the many political, economic, and technological hurdles standing in the way of a clean and prosperous American energy economy. An energy education panel later in the afternoon, hosted by Breakthrough Senior Advisor, Teryn Norris did offer an inspirational message for students wondering how they could influence one of the greatest challenges of our time -- albeit from slightly less notable sources. The panelists, Director of Stanford's Precourt Institute for Energy Professor Lynn Orr, DOE Principal Deputy Assistant Secretary Dr. Henry Kelly, and Cameron Gorguinpour, the Director of Scientists and Engineers for America, all commented on the troubling shortage of engineers and scientists graduating from America's top universities relative to other countries and underscored the critical role that energy education will play in America's ability to compete in the clean energy race. "There's little doubt we're in a race for our lives to maintain our productivity and competitive edge to keep high tech manufacturing here in the U.S..."
In this context, the panelists also discussed RE-ENERGYSE, Presidents Obama's STEM education funding proposal that Congress slashed from the 2010 budget but which is back on the docket this year. "One of the things the U.S. has always been able to do is attract students from all over the world...Continuing to attract them and holding them is one of the critical parts of innovation policy." 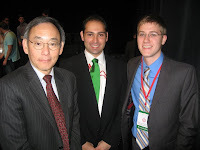 While Secretary Chu missed a golden opportunity to inspire both the students in the room and the thousands that will undoubtedly watch the video across the country, the Secretary's consistent emphasis on the urgent need for a large-scale federal investment in America's innovation capacity should send a clear enough message to America's future scientists, engineers, politicians, and entrepreneurs: we need clean cheap energy, now. "Scientists have come to the service of our country in times of national need," Secretary Chu said. 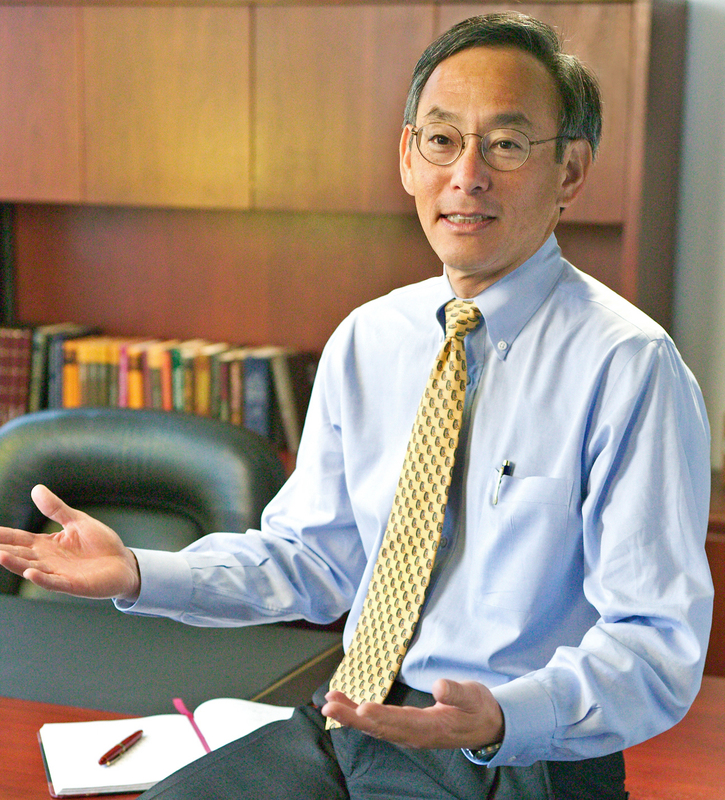 If Congress funds energy innovation at the level Secretary Chu argues is necessary the next generation of innovators will rise to meet the nation's challenges again. You can view the Secretary Chu's speech in its entirety here. You can view the "Educating the Energy Generation" panel here. When you think 'green jobs,' do you conjure images of green hard hats, caulk guns, and tool belts? Well it might be time to start thinking about 'green' lab beakers, 'green' drafting tables and 'green' brief cases as well, because the careers needed to secure competitive clean energy industries will also run the gamut from cutting-edge researchers and high-tech engineers to innovative designers and fearless entrepreneurs, according to Dr. Henry Kelly, Principal Deputy Assistant Secretary at the U.S. Department of Energy's Office of Renewable Energy and Energy Efficiency. So what is a green job? Well green jobs are architects and engineers that build buildings, design buildings that operate at extremely low energy use. They are people that design, manufacture, and install devices in buildings ranging from high-tech windows to lighting to sensors and controls and electronics. It means looking at radically new industrial processes which simply replace previous kinds of industrial manufacturing with sophisticated bionumetics and nanotech approaches, to cutting down the material intensity and energy intensity of production, this is the kind of thing you need to do to stay competitive in the modern world. If you look at what the nation's transportation system is going to look like, Henry Ford looks like he's toast, it's going to be replaced with an entirely new generation of either extremely high efficiency fuel powered vehicles, electric vehicles, perhaps even hydrogen fuel cells - the people that make and maintain these are going to be operating in a different world that's an enormously sophisticated operation. If you're looking at where power comes from, of course you have the entire range of science and engineering involved, you mentioned we're relying on geologists to tell us how to get geothermal energy, getting very sophisticate semiconductor manufacturers involved in the production of solar cells and CSP, if you look at biologically based fuels and materials, some of the most sophisticated biological processing techniques. So this is an enormous range of skills, but apart from the technical skills you also need people who really understand the economics of finance... behavioral economics, people who understand policy, all of these qualify as green jobs and it touches I think almost every academic discipline. The good news is that if we do this right we're generating a lot of new interesting jobs, not just for sophisticated designers but for people who are manufacturing and operating these. "If you're looking at how the U.S. fairs competitively, we have far from the most highly trained workforce. In fact we're the only country in the top 20 OECD countries where... the average high school graduation rate is going down. We're static in university degrees and other countries are bypassing us, and they're getting degrees increasingly in the sophisticated subjects we need to move forward, both in energy and rebuilding our economy. So we're facing this tremendous dilemma, where we have these opportunities to rebuild the economy around sophisticated technology that's clean, but the ability to turn out people who are able to actually take advantage of these opportunities is declining. It's something we're incredibly concerned about. While attention has been paid in recent years to funding new training programs for 'green collar' technicians, building trades, and manufacturing positions, the federal government has only just begun to put resources towards training and empowering the wide variety of cutting-edge innovators, engineers, and entrepreneurs needed to stay competitive in the 21st century clean energy race. "The kind of things that you need to do make an economy that is clean and reducing its fossil fuel consumption is precisely the same thing you need to do to make the economy productive and competitive internationally, which means constantly transforming itself around new technology," Dr. Kelly said. "If you look at the kind of technologies we’re talking about, it goes touch virtually every part of the economy." With Asian and European competitors pulling farther and farther ahead in competitive clean technology sectors, the economic stakes of these investments are high. "There's little doubt we're in a race for our lives to maintain our productivity and competitive edge to keep high tech manufacturing here in the U.S." Dr. Kelly declared. In 2007, Congress passed the Green Jobs Act which authorized $125 million in annual funding to develop training programs for workers in a variety of renewable energy and energy efficiency industries. The program was first funded with a $500 million chunk of the American Recovery and Reinvestment Act (the stimulus bill), and further funds were allocated in the climate bills now struggling to secure passage in Congress. While the Green Jobs Act has advanced technical training programs at the nation's community colleges and technical schools, funding to inspire and empower students at four-year institutions to enter a wide range of careers crucial to competition in the clean energy sector has languished in Congress. In 2009, President Obama's FY2010 budget included a new Department of Energy and National Science Foundation-run program called RE-ENERGYSE, the nation's first program aimed at strengthening America's position in clean energy education. Despite the urgent need for such a program, Congressional appropriators rejected the $125 million funding request. The Administration hasn't relented, however, and RE-ENERGYSE is back in the new FY2011 budget request now on its way to Congress. The $74 million program would be the first small but critical step to re-energize a new generation of scientists, innovators, and entrepreneurs ready to tackle the United States' energy and competitiveness challenges (see this fact sheet for more [pdf]). Ultimately, however, greater funding will be necessary to help the next generation of intrepid American innovators rise to the nation's clean energy challenges. "In 1958, right after the Soviet Union launch Sputnik, the U.S. federal government authorized the National Defense Education Act, which invested billions of dollars over several years to try and regain our competitive edge in general science and engineering, and more specifically in the space race," said Teryn Norris, the moderator of the panel, adviser at the Breakthrough Institute, and director of Americans for Energy Leadership, a student-led initiative campaigning across the country for investments in clean energy education and innovation. With American facing a new race to dominate the high-tech fields of the 21st century, the federal government will ultimately need to secure investments on the scale of the National Defense Education Act to keep the nation's competitive edge. Dr. Kelly and Mr. Norris were joined on the panel by Dr. Lynn Orr, director of the Stanford Precourt Energy Institute and Camron Gorguinpour, director of Scientists and Engineers for America. You can watch a video of the panel here. The introduction of "Buy American" legislation in the Senate in response to a report that more than three quarters of funds from a clean energy stimulus program went to foreign companies is understandable and probably good politics. Unfortunately it will do nothing to solve the root of the problem, which is that for 30 years Congress has done little to support the development of domestic clean energy industries. Given the decades-long absence of a national clean energy strategy in the United States, the fact that foreign companies are benefiting most from the stimulus grant program should come as no surprise. The U.S. has always lacked a proactive, consistent clean energy technology strategy that provided support for clean tech companies through each stage of the technology value chain, from R&D and innovation, to manufacturing and commercial deployment at scale. Instead, U.S. clean energy policy has historically been characterized by a disjointed collection of loosely associated, often inconsistent incentives. One example is the wind energy production tax credit (PTC), a demand incentive that has routinely been at perpetual risk of expiration, and actually lapsed on three separate occasions over the last decade. With the real possibility that the policy-driven demand for wind turbines would dry up in any given year, companies were understandably wary of investing in large manufacturing facilities in the United States. While the United States was once a pioneer in developing and commercializing clean energy technologies, from solar cells to nuclear power, we now lag behind our competitors in Asia and Europe in the production of virtually all clean technologies. Other nations have leapt ahead by implementing clean energy strategies that coordinate long-term investment in integrated research and development, low-cost financing for clean tech manufacturers, and stable policies to ensure domestic demand for clean energy. Germany has become a leader in solar and wind through public-private financing mechanisms to finance energy innovation as well as strong demand side policies, such as the solar feed-in tariff policy adopted by the government in 1991. Likewise, the Chinese government supports the growth of its domestic industry through state funding for R&D, low-cost financing and free land for manufacturers, and targeted deployment incentives for different technologies. 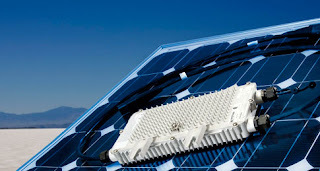 China is now the leading producer of solar cells and wind turbines in the world. It's worth noting what a historical anomaly it is for other nations to lead the world into a new technological revolution with the United States as spectator. We were once leading manufacturers in almost all clean energy technologies, but production has long since shifted overseas. Today U.S. companies can't even supply the domestic market, let alone take full advantage of enormous clean tech export opportunities. Beyond manufacturing, the United States is also giving away the greatest advantage it has in the clean energy race--innovation. For the United States to build a thriving domestic clean tech industry it will have to stay one step ahead of the competition, quickly developing and commercializing the next generation of clean energy technologies to make them cheaper and more reliable. Unfortunately, new innovative technologies are just as likely to originate in other nations as the United States, due to a chronic underinvestment in energy R&D. Today, the energy industry invests only three tenths of one percent of revenues in the research and development of new technologies. This pitiful figure is one-hundredth the amount of private sector revenues that flow into R&D in priority industries like IT and pharmaceuticals. Public energy R&D funding is also shamefully low. While the United States government invests $30 billion per year in health research, energy R&D has stagnated for two decades at around $5 billion per year. Other nations have surged ahead in innovation investment--Japan and South Korea invest twice as much in energy R&D as the United States on a per-GDP basis. How did we get here? As increasing global competition put pressure on the American industry, we became complacent, believing that our historical strengths in innovation would ensure that new clean energy technologies would continue to be invented here. This faith was fueled by a pervasive ideology advanced by both anti-government conservatives and neoliberal Democrats that argued that innovation--our "comparative advantage"-- would carry us once again to economic prosperity. Unfortunately, as manufacturing has moved overseas, innovation has followed. An authoritative report by the Information Technology and Innovation Foundation (ITIF) shows that the United States has fallen to 6th out of 40 developed nations in innovation capacity and last out of the 40 in making the investments necessary to be innovative and competitive in the future. Other rich nations like Germany and Japan didn't make the same mistake we did--they continued to invest in the creation of high-tech manufacturing industries and their domestic innovative capacity as a foundation for future economic prosperity. In the context of three decades of neglect and underinvestment in the domestic clean tech industry, there is no reason that we should expect either the short-term stimulus grants or a "buy American" policy to make the United States competitive in the clean tech race. Only a comprehensive clean energy competitiveness strategy built around long-term, coordinated investments in R&D, manufacturing, and markets can forestall further American decline in the global clean tech industry. As other nations bring their own competitiveness strategies to the table, the United States remains noticeably absent. I've been familiar with mountaintop removal (the practice of blasting the tops off mountains and dumping them in streams to get at coal seams maybe a foot thick) for years now. But this week it became personal. I'm here at the 5th Annual End Mountaintop Removal Week in Washington, joining residents from the coalfields of Appalachia in meetings with our Congressmen, gathering support for the Clean Water Protection Act (HR 1310) and the Appalachia Restoration Act (S 696). This may be the 5th year, but the momentum is tangible. We have 166 co-sponsors for the CWPA, bi-partisan support in both Houses and committee chairmen who are receptive to moving this forward. To build even more momentum, today is a National Call-In Day to urge your Congresspeople to support these bills. Their offices are hearing from us in person and need to hear from even more constituents. Please, take the two minutes to call your Rep. Here are some of the most powerful points I've heard from local residents to communicate with members of Congress. Coal jobs are declining. Mountaintop removal displaces deep mining jobs by replacing people with giant machines. 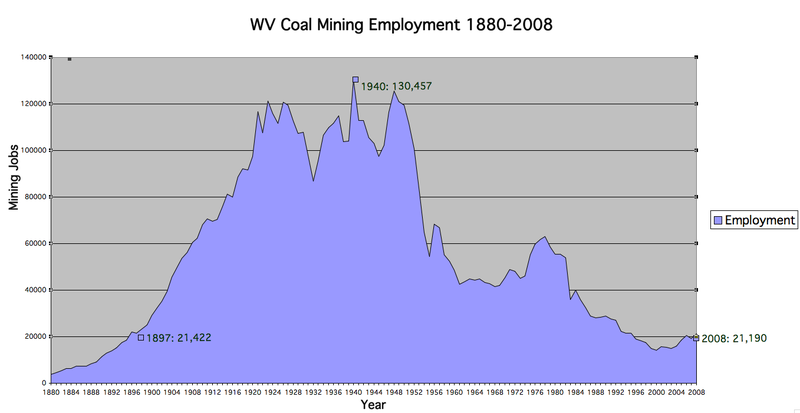 Mountaintop Removal drives away jobs. What business wants to start up in a place with undrinkable water, coal dust and blasting debris falling from the air and buildings that develop cracks in their foundations from the blasting? 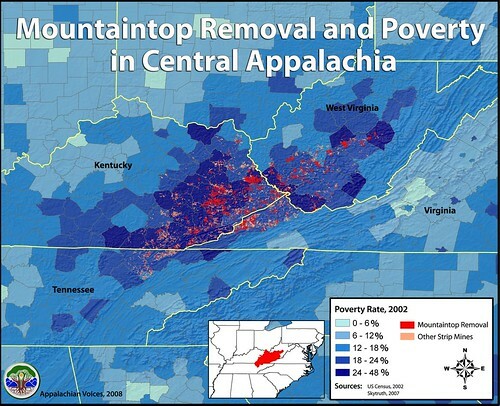 As you can see above, mountaintop removal and poverty are highly correlated. Coal is not the answer for economic revitalization. People cannot live without clean water. When your water is brown, or black or red, don't drink it. Don't shower in it (the mist gets into your lungs). Appalachia once has some of the cleanest, sweetest water in the country, because the mountains and their forests act as giant water filters. When coal companies shove mountaintops into streams, not only does this pollute the streams, but it destroys the natural filtration. Support is needed from outside the region. The almost non-existent enforcement of environmental protections, intimidation from coal companies and elected officials who were bought and paid for by coal money have worked to silence this issue. Appalachia deserves to enjoy its rich natural resources, not destroy them forever. Mountaintop removal has already destroyed an area the size of Delaware. How many more states are we willing to sacrifice? Please call your Rep. We can change this. By Leigh Ewbank. Cross posted at The Real Ewbank. The collapse of cap-and-trade in the United States has implications for Australian climate policy, making the Rudd Government’s mission to pass a cap-and-trade scheme even more difficult. The Australian Senate has twice rejected Labor’s Carbon Pollution Reduction Scheme (CPRS) and is set to reject the bill for a third time in May. Unlike the previous rejections, the stakes are higher this time around. A third strike for the proposal just months out from a national election would be a demoralising blow for the Labor Party. The Rudd Government faces a tough political environment. The Opposition will use the US Senate’s abandonment of economy-wide emissions trading to attack the Government. Tony Abbott has shown considerable political nous by betting correctly that the US Congress would not pass emissions trading legislation in the near term. This foresight allowed the Coalition to corner Labor by proposing a suite of “direct measures” to reduce Australia’s carbon emissions. By staking out the logical alternative to carbon pricing measures, the Coalition hopes to position Rudd as a policy copycat or worse—incompetent. The Greens add another layer of political complexity for the Government. Labor can only win Greens support for the CPRS by agreeing to substantial amendments, but Labor are too risk averse and evidently uncommitted to climate change to make the deal. Similarly, Labor could throw their weight behind the Greens’ interim carbon-pricing measure, but the move gives the minor party a much needed boost heading into the election and inadvertently bolsters the Coalition’s claim that carbon pricing is taxation by another name. In any case, the Government would still need two additional votes for either measure to pass the Senate. While the Labor Government has the trigger for a double dissolution election they won’t risk one. On one hand, Tony Abbott is polling better than expected and Labor hasn’t quite figured out how to deal with the new Opposition Leader. On the other, public support for the CPRS has declined and the Government fears a scare campaign based on the easy-to-understand “ETS = great big tax” message. By far the worst option for Labor is to abandon the CPRS entirely. The Prime Minister simply can’t walk back his “greatest moral challenge of our time” statement he made as Opposition Leader and reiterated in his pre-Copenhagen speech to the Lowy Institute. This move would make the Prime Minister and his government look weak and unprincipled in the eyes of the public. Labor is stuck between a rock and a hard place. While the death of cap-and-trade in the US presents an obvious challenge to Rudd and Labor, it is also an opportunity. The recent development provides the PM with an escape route for his troubled emissions trading scheme. With consistent messaging citing the changes in US climate policy as the rationale for a new approach, Labor can avoid Opposition attacks. The key to success rests on presenting a credible alternative policy with an equally powerful political narrative. Adopting a nation-building framework for climate change policy is the Government’s best way forward. In addition to providing a potent political narrative to frame their agenda, the approach deals with the technological problem at the heart of climate change. Australian renewable energy advocate Beyond Zero Emissions (BZE) has recently released the executive summary of its Zero Carbon Australia 2020 plan—a detailed blueprint for Australia to transition to 100% renewable energy by the end of the decade. BZE rightly emphasise the need for public investment in critical renewable energy projects as integral for reducing the nation’s contribution to climate change. Beyond Zero Emissions spokesperson Mark Ogge concedes the Zero Carbon plan is expensive. The plan would require investment in order of $35-40 billion per year for a decade—the equivalent of the 2009 economic stimulus package each year to 2020. Some commentators, politicians, and vested interests will no doubt argue that this level of investment is difficult. Nonetheless, BZE are on the right track. Their cost estimates are based on the ambitious goal to generate all of Australia’s energy from renewable sources by 2020. Implementing the measures over a longer timeframe would make the plan more economically viable, more politically palatable, and still deliver considerable carbon emissions reductions. The death of cap-and-trade in the US can make Rudd’s job harder, or could be used as the rationale for a new nation-building approach to climate policy. Let’s hope for the latter.